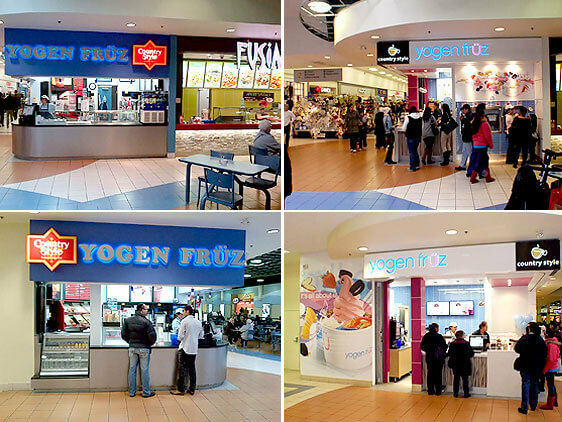 Beginning a few years back, Jump was retained to redesign the face of Yogen Früz, the main driver of the frozen yogurt category in Canada. We developed an all-new healthy brand communications strategy and contemporary retail image that replaced the heavy, dated look that their assets projected. With the massive number of locations, mainly in food courts, updating each existing store to reflect the new image has been an on-going process Jump continues to be on board with. 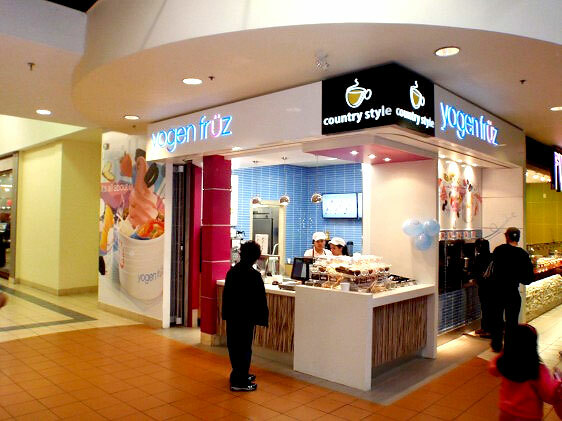 The Yogen Früz inside the Shoppers World Brampton Mall is one of the most recent examples. As you can see from the images above, the store has been given a complete overhaul to align with the light, clean core message of the brand. Critical elements of the updated brand package are reflected in the overall design, with the Ü-serve and toppings stations showcasing the latest evolution of the Yogen Früz model. Follow the links for an in-depth look at how we lightened up and elevated Yogen Früz and their retail environments as well as the latest on froyo in Toronto (if you were around this summer, one word sums it: Yogurty’s).